To go by the so-called Mainstream Media, Marvel stole DC’s thunder this week. While DC released the mostly good DC Rebirth #1, Marvel brought Steve Rogers back to his younger self, made him Captain America again, and then destroyed most people’s childhoods. Again. By the way, if in that previous sentence, you didn’t know that Steve Rogers had been an old man (in the comics), then really, until the news told you to be upset, you probably weren’t. Because for two years, he has been a remarkably hale and hearty senior citizen, going by the name Steve Rogers, Super Soldier. In the meantime, Sam Wilson aka The Falcon has been Captain America. Thanks to the machinations of a sentient cosmic cube in the form of a four-year-old girl, Steve is young again, and he and Sam are both Captains America. Once more — if I lost you at “sentient cosmic cube,” you have probably not been reading the comics anyway. You’re a fan of the movies, and whether comics fans like it or not, there are a lot more movie fans than there are comics fans. That’s the simple truth. It’s why DC keeps rebooting/rebirthing, trying to get more readers, and why Marvel keeps upsetting the status quo (then resetting it). Both companies want readers. I had a remarkable experience yesterday. The young reader known as Kid McCaw doesn’t follow comics news on the internet. He doesn’t have a Facebook feed full of people expressing their outrage. 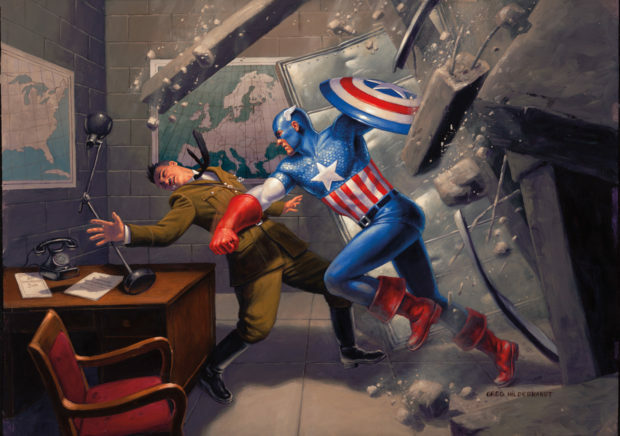 Until I handed over my copy of Steve Rogers, Captain America #1, he didn’t know what the big twist would be. He simply… read the comic. And he gasped at the last panel. He bemoaned, “how can that be?” (I’m probably paraphrasing melodramatically.) And then, he wondered when the next issue would come out so he could find out what happens next. That means that for a 12 year old, writer Nick Spencer has done exactly what Marvel hoped he would do: hook a reader. Putting aside the twist that somehow Steve Rogers has been a double agent for Hydra all these years — and as Tom Galloway has pointed out to me, the worst double agent in history, since he’s spent most of his modern career smashing Hydra — is the book any good? Yes. Spencer brings in a series of Captain America’s sidekicks, showing us the shadow they all walk in trying to make him proud. Well, almost all of the sidekicks, because the Winter Soldier isn’t there. He’s busy trying to protect Kubik, that sentient cosmic cube, over in Thunderbolts. Steve has moments of doubt, sharing his emotions with Sharon Carter, who hasn’t de-aged. 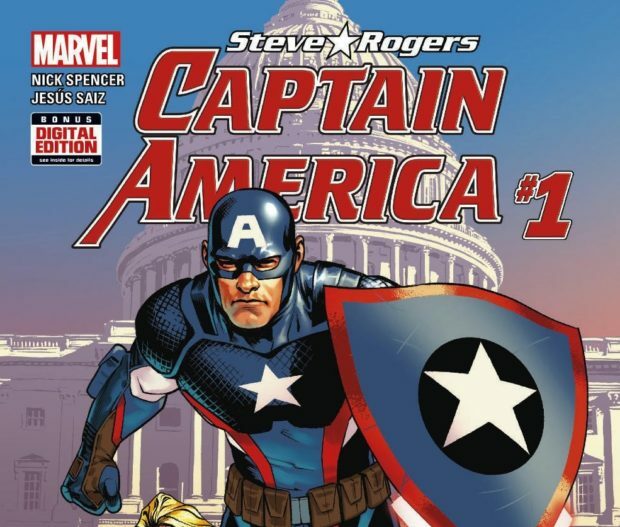 Every few pages, Spencer cuts over to the indoctrination of a domestic terrorist under the tutelage of a chillingly calm Red Skull, and flashes back to scenes of Steve Rogers’ childhood, when allegedly his mother was brought under Hydra’s sway. Artist Jesus Saiz delivers beautiful pages that don’t rely too heavily on splashes and spreads — this is a dense, satisfying read that bounces off the page. He’s also designed an interesting alternate costume for Captain America, which should be another clue that of course this isn’t quite Steve Rogers. Maybe Steve has been brainwashed. Maybe the past has been altered. We did just come out of Secret Wars after all. And maybe the point of “revealing” Steve Rogers as an agent of Hydra (at the same time that Zemo and the Red Skull are about to fight over leadership) is so that Spencer and Saiz can talk about how easily seductive dangerous rhetoric can be, and how ultimately, someone like Steve Rogers has to stand against it. 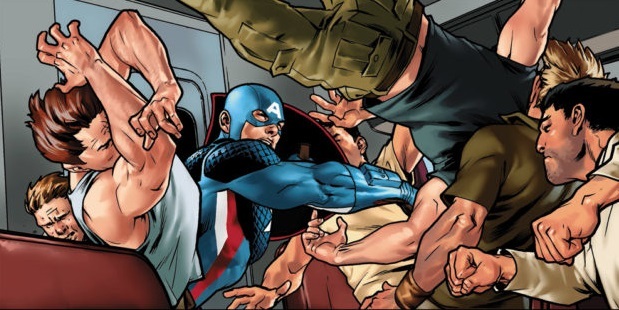 That’s why he’s Captain America, and we’ll have to keep reading to see what’s really going on. The other truth is, though, that this controversial book only had an estimated distribution of 33,000 copies. If this turn of events upset you, remember that far more people than that saw Captain America: Civil War, and that Captain America is the one who has more cultural impact right now. Right now, even I admit that Chris Evans is my Captain America. But I can’t wait to see how the comic book version gets restored to being like the one I know and love. Because that’s a story, and that’s why I read comics.